Any time now I expect a flood of aspiring young racers to rush into operating rooms demanding knee surgery. Just like kids used to (and maybe still do) wear those obscenely-priced shoes endorsed by Michael Jordon to try to Be Like Mike, I figure young racing wannabes will want to Drive Like Denny – starting with wearing a knee brace. Denny Hamlin has been on a tear ever since his knee surgery, winning three of six Sprint Cup races, capped by last weekend’s dazzling Darlington double – a Nationwide win on Friday and a Cup victory on Saturday. The track Too Tough to Tame met a driver with Too Much Grit to Quit. Remember all the second-guessing over Hamlin’s decision to have his surgery in-season? One doctor/sports writer opined that Denny had flat blown the season, that he’d spend the rest of the year limping around the track and – maybe – he would be mended enough to resume real racing by next year. 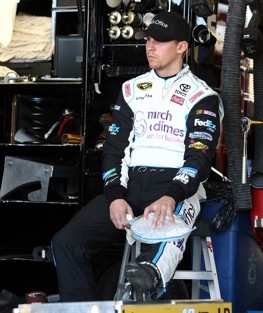 Other physician-pundits speculated about who would follow Hamlin around each track, standing by as his relief driver. Surely, according to conventional wisdom, Hamlin wouldn’t be able to drive an entire race. But drive he did. And pretty darn well, as it has turned out. I admit I’m amazed. I remember when Darrell Waltrip broke a bone in his leg in a crash at Daytona and insisted on starting the next race at Pocono despite wearing a hip-to-ankle cast. I watched on pit road as the crew stuffed DW through the car window. After starting the race and running a couple of laps for the points he came in and had to be hauled back out. Darrell was wincing in pain. It hurt to watch. Granted, there’s a big difference in knee surgery and a broken femur. But I’ve followed a lot of athletes over the years who have undergone similar knee operations and they all said it was an extremely painful recovery. Doing even routine things that required bending and placing weight on the knee – such as sitting down and getting up – was a challenge. It’s hard to imagine someone climbing through car window, wigging down into a cramped cockpit, and pumping the pedals throughout an entire race. Yet Denny has been doing it week after week and twice at Darlington – one of NASCAR’s most physically-demanding tracks. Hamlin’s post-surgery surge has boosted him all the way to 6th in the standings and we’re starting to hear his name mentioned prominently in conservations about championship contenders. I don’t know if he can maintain his hot streak, make the Chase and seal the deal with his first title. If he can, what a remarkable story it will be, a tale of courage and determination. Even if not, then he deserves recognition for what he’s already done: It’s time to start a Tough Guy Award, and I nominate Denny Hamlin.